This gorgeous beaded dress by Vera Mont has been created for the new season with wonderful attention to detail and beautiful design. The dress has capped sleeves with a delicate arrangement of beadwork that adorns the dress. 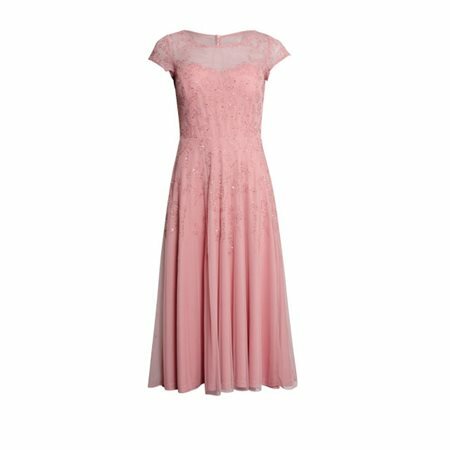 We are loving the rich blush pink colour of this dress, it is simply stunning, and the swing finish of the skirt allows the dress to flow beautifully as you walk or dance! The dress is ankle length with layers of fabric, it closes at the back with a keyhole detail. This dress would make a perfect choice for a special occasion at any time of the year.